Travel diary - An impromptu New Years Eve in Montmartre, Paris! We decided it would be too much of a rush to book somewhere for NYE celebrations, so researched online the less-busy spots to share the New Year excitement and settled upon walking up to Montmartre. In our minds, we’d have a walking-drinking-eating journey - leaving our hotel to amble up to Monrmartre, stopping for the odd cocktail / glass of fizz / Nutella and banana crepe en route. Unfortunately, the journey wasn’t as exciting as I’d visualised, and we ended up walking through some rather intimidating Parisian streets, even having to cross the road from one man who kept stopping and turning around and looking at us. So we didn’t get our drinks / cocktails - but we did manage one “not too bad” crepe. We arrived at the top of Montmartre to find hundreds of people already there, clambering (and falling) down the muddy banks with picnic blankets and bottles of champagne (damn, I’d already polished mine off while dry-shampooing my hair). Chris nipped off to find a loo while I precariously tottered down the sloping bank, Chanel bag in tow (please don’t fall, please don’t fall). I find a spot, where you definitely can’t see the Eiffel Tower, but you can see the Parisian skyline. Chris joins me and we share the whisky we’d brought with us in a hipflask. It’s extremely uncomfortable sitting on the slope, but I’m glad we’re there an hour early considering how many people are still arriving, despite my numb backside. Soon enough the new year is upon us, signalled by a dozen or so cheers at 11.58 (my iPhone told me they were slightly premature). We eagerly await the fireworks erupting over the Parisian skyline before us. And wait. And wait…..
A firework’s set off from the muddy bank (rather dangerously, I thought), and that’s about as much as we get. We can’t see the Eiffel Tower. And there’s next to no fireworks over the city skyline. Huh?! Why did thousands of people come all the way up here for that?! People begin to clamber down the hill and disappear back into the winding city streets. Chris and I are still sat there, still confused. We just can’t understand why people congregated in such an uncomfortable place, when there was absolutely nothing to see. Surely a park would have been flatter and more comfortable? Anyway, it was an experience we won’t forget, and we too, clambered off to find ourselves our next crepe. It was a new year, after all. Buying my first Chanel handbag - an candid tale! Hi peeps, here’s a not-so-little story about buying my first Chanel bag five years ago this week! I’d dreamed of, and actually attempted, buying a Chanel bag for several years before I actually bought it. I love the style of the bags, the classic, timeless shape, the fact they don’t lose their value, and the fact that in my opinion, they make every outfit look better :D Anyway, as much as I dreamt of buying one, I had never spent that kind of money on anything before, and the thought of it made me feel sick! So, I had enough “extra earnings” for my bag! While back in the UK on a visit home, I took the bus from Wales to London to stay with my sister and buy THE Bag. Alllll the way to London I honestly felt sick about spending so much money on a bag. I kept thinking I could buy a lesser-expensive designer bag and have TWO! Or other things I could spend the money on - none of which I needed or wanted as much as THE Bag. My sister kindly rang around the Chanel boutiques in London to ask whether they had the bag in stock, doing so in a faux-posh-granny voice that had me in STITCHES on the bed beside her. “Do you know what, I’ve found myself in London with some spare time, and thought I’d pop along to your store and have a little rummage”. The store in Harrods said they had one in stock, but to hurry as they couldn’t guarantee it would be there much longer (they apparently sell like very expensive hot cakes!). So I leave Harrods feeling sick but also slightly relieved, because I’d been so hesitant to part with my £1000 for “just a bag” anyway. My then boyfriend, now husband, Chris and I visit Hong Kong 12 months after the first attempt (there was no Chanel stockist in NZ when we lived there - I’m not sure if there is now - and so I couldn't buy The Bag there). I’ll perhaps tell you about my trip to Kong Kong another time, but to sum it up, I couldn’t manage with the humidity and ended up wearing the loosest, baggiest clothes I had with me - my hair was scraped into a bun on my head, and there was no point in wearing makeup because it sweated off as soon as I left the air conditioned hotel. I had a sweat moustache for the whole three days. Just not a climate I managed well in!! Anyway, we are at the airport, me dressed like I don’t know what, (and there’s no way I want to try and find a photo of (if one exists! )), and I pluck up my courage to enter the Chanel store. I ask the assistant for the bag - get pointedly looked up and down, and told “no” they do not have The Bag. To be fair, I looked such a mess I couldn’t blame them for looking me up and down, but it was still extremely rude, and I left bag-less. This is just a quick one! We visited Sydney, entered the store and checked out the price. It was £1000 MORE than buying the exact same bag in the UK. So we left. I’ll keep this one quick, too. Chris was in London for business, I managed to persuade him to ring the stores and ask if The Bag was in stock. Yes it was! On his way to the airport from London he managed to get his taxi driver to pull over on Oxford Street (or some busy main London street) while he left his suitcase in the taxi and ran into Chanel to ‘quickly’ buy The Bag. The Bag was there, he got it packed up, all ready to go - and his New Zealand bank card wouldn’t go through with the transaction (maybe it felt sick, too, haha). He said they tried it multiple times, and in the end he had to go because the taxi was waiting and he needed to get to the airport. I cried when he rang me and told me. And so now it is December 2013. I am in New York with Chris on a holiday there half-way home from New Zealand to Wales for Christmas. The price of The Bag is now £2750 because the longer you leave it, the more the flipping price goes up - if only I’d bought it in London that first time!! I’ve made the decision, and we go to the Chanel boutique on a wonderfully snowy day. We go in, and YES they have The Bag in stock! The sales assistant offers us a glass of champagne. I’m so nervous and sick about spending this money on this flipping bag that I decline, almost wanting to get the whole thing over as quickly as possible. I pay for The Bag on two bank cards - one NZ and one UK - because I don’t want Chris’ London bank card fiasco to happen to me!! And the cards work. The Bag is mine. We are going for a whole day walking in the snow in Central Park and so I ask if I can collect The Bag later. The assistant says of course. I don’t use The Bag for another two days because I am frightened someone will steal it off me (LOL). The first outing it has is to an AMAZING Greek restaurant in NYC. I’ve now had Yorkie for five years, and it is still my prized possession. It never sits on the floor, it stays neatly in its dust cover when it is not being used. It is what I grab when the fire alarm goes off and we have to stand outside our apartment in our PJs at 2am in the morning. I don’t save Yorkie for special occasions, because I didn’t pay £2750 for a bag to sit in my wardrobe 90% of the year, though I obviously don’t use it every day. Just a note - I know Chanel bags, designer bags - things like these are not everyone’s cup of tea. This is my opinion and an honest account of how and why I bought my bag. I recently visited Bicester Village for the first time. I’d heard so much about it, it seemed everywhere I looked people were mentioning Bicester Village as THE place to shop and so I was very excited to get there myself. From Plymouth it’s a fair old drive - 4.5 hours each way with slight traffic delays. I was attending a wedding in Oxford in September and so it was the perfect opportunity to visit Bicester. And I left empty handed! Bicester Village is a designer outlet, but these are still designer prices, so as I’m unfortunately not made of money, I carefully considered anything that caught my eye. And managed to peel myself away from them! I do love an occasional splurge item (I count my Chanel handbags amongst my prized possessions), but I try not to buy things for the sake of it, or because it is a good deal (I have done this SO many times in the past and am really working to refrain myself in these instances!). There were no Chanel or Tiffany shops there (these would have been my weak spots). Haha. If you follow my Instagram you’d know I’ve been trying to sort through my storage container FULL of clothes, shoes, bags, any other things that my awful magpie-hoarder-self has collected for the last 12 years. As a result of my hoarding-detox I’ve been really trying to use the things I already have and not buy more! In short, I’ve made a resolution with myself to be less wasteful and only invest in pieces that I genuinely love and/or need. The village was really busy, but parking wasn’t too difficult and we managed to grab a seat for lunch as soon as we got there too (I also had a margarita!). My tip would be to skip the restaurant and opt for one of the many little eatery stalls instead - they’re much quicker and cheaper, so more time and money for shopping! Bicester Village is definitely worth a visit, and had I seen something that I really absolutely loved or needed, I’d have bought it. On this occasion, that wasn’t so. I left the village feeling a mix of disappointment at not buying anything from the place i’d wanted to visit for so long, and pride in the fact I’d not bought anything just for the sake of it. 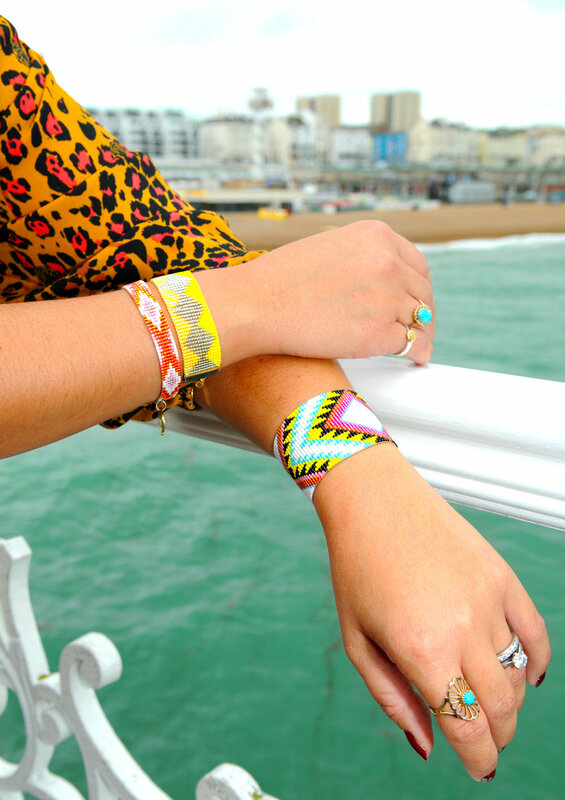 On my recent trip to Brighton I was thrilled to meet with Clare from Colourbloc Photography for a little impromptu photoshoot on Brighton Pier. 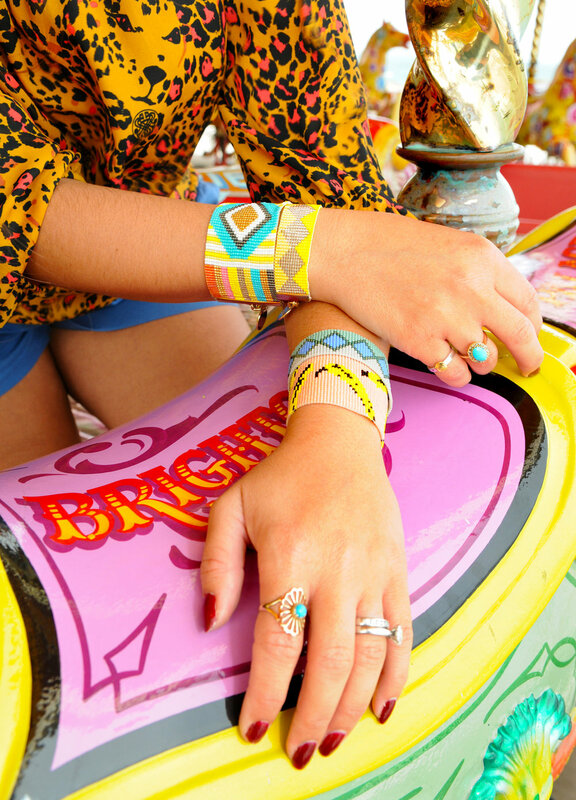 Clare is a talented commercial photographer who loves bright colour as much as I do, and so we had a lot of fun dashing around the funfair looking for inspiration! 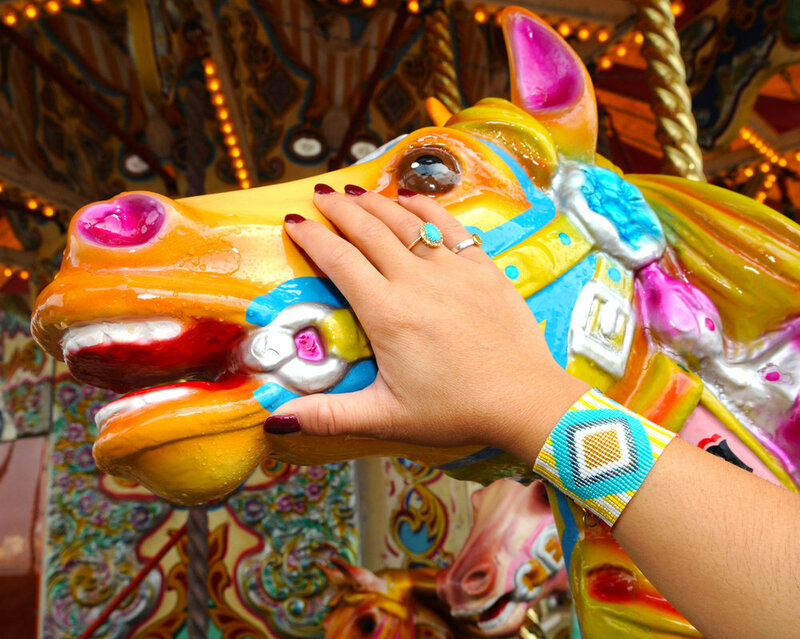 My favourite ride was the carousel, and I did get a couple of odd glances whilst clambering up onto the ponies, bracelets raised high (all in the name of photography!). You can check out our photos below, and see more of Clare's photography on her Colourbloc website and Instagram. I enjoyed it so much that I want to do it all again!